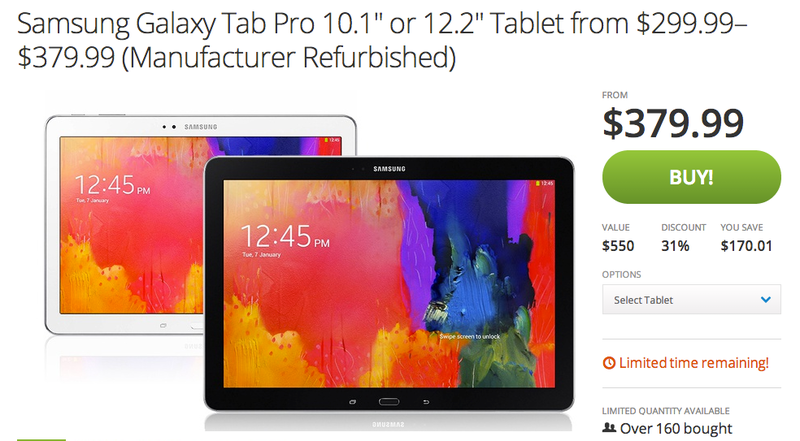 Groupon is currently hosting a deal on a few Samsung tablets, most notably the Galaxy Tab Pro lineup of high-end slates. They have four models in total on sale, starting at just $299 up to only $379.99. The tablets are manufacturer refurbished, but do come with a 90-day warranty through Samsung. The devices for sale are the Galaxy Tab Pro 10.1 in White and Black, as well as the larger Tab Pro 12.2 in White and Black. Specs include high-res LCD displays, 8MP rear-facing camera, 2MP front-facing camera, microSD card slot, and run Android 4.4+. If a Sammy tablet is on your shopping list, hit up the Groupon link below.